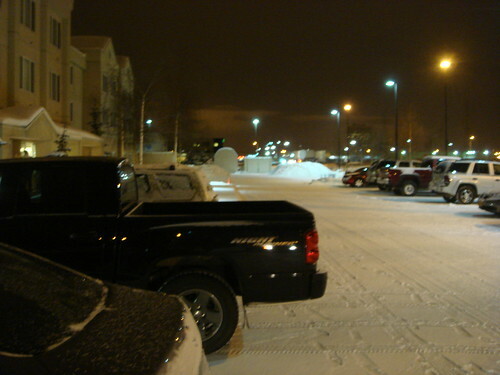 Chris had the opportunity to go back to Alaska and see Anchorage in the winter. He was going for work so he didn't have a lot of time to do the touristy thing (all the tourists places were closed for the season anyway). He said Anchorage was very dry and even though there was a lot of snow, it was a really dry snow. The roads were packed and he had little traction in his rental Corolla. I'm glad he's home. I think he's glad too. For as long as I can remember growing up, every year my dad would bring home these printouts with these ASCII charts for my aunt the nun. They were biorhythm charts and I can remember looking over this print outs following the rhythms with my fingers and pointing out what days were going to be "bad" days. I've been in a rotten mood all week (especially towards the beginning of the week). Even though it wasn't a great week, it wasn't nearly as bad a my mood and I made it seem. This got me wondering and I decided to check out my biorhythm. Sure enough my chart shows an emotional and physical low for the beginning of this week. Coincidence? Maybe. It's hard to believe that everyone who shares my birthday has the same rhythmic cycle as I do (biorhythms are based on your birthdate). I had all but forgotten about this small part of my childhood until sometime last year when I was discussing with a friend over IM our rotten moods. Something triggered my memory and I decided to check it out. Sure enough our charts mirrored our moods. The few times I've checked since then, it's been pretty accurate. I'd be interested to know does your chart reflect you?